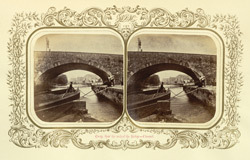 "Clonmel, the assize town and capital of the County of Tipperary, is situated on the River Suir, which here separates the Counties of Tipperary and Waterford, and is built principally on the north side, and partly on some islands in the river, which are connected with each other and the town by bridges of considerable anitiquity." During the latter part of the 18th century and early 19th century Clonmel developed into one of the main industrial and commercial centres of Ireland. By the mid 1900s vessels of up to 200 tons could dock at Clonmel. Extract above from 'Stereoscopic Illustrations of Clonmel'.